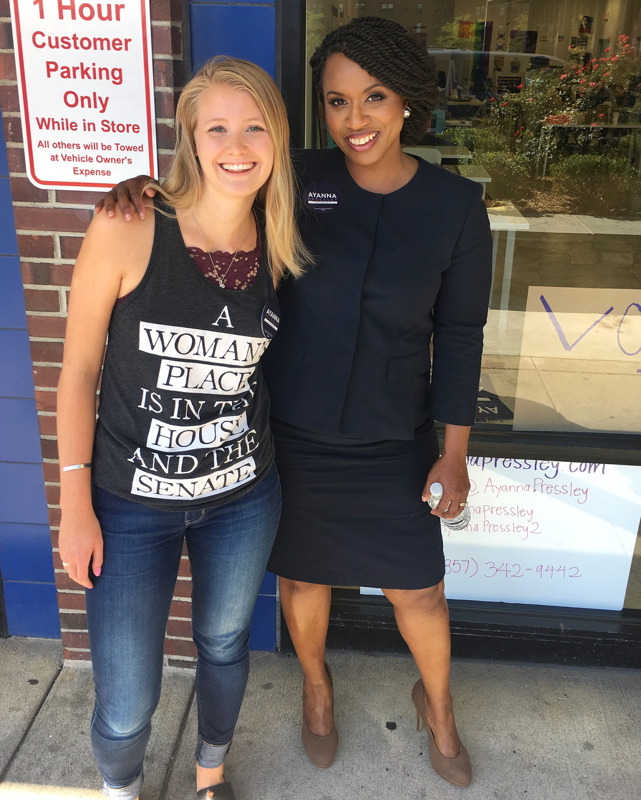 On September 4, 2018 Ayanna Pressley made history. 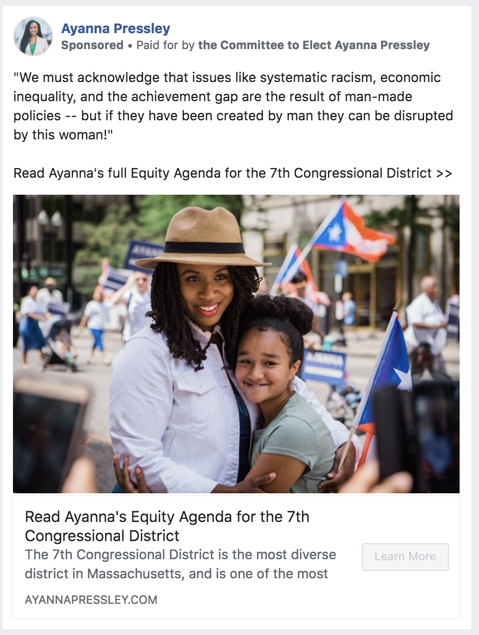 She beat a 10-term incumbent by 18 points, and will soon become the first woman of color to ever represent Massachusetts in Congress. While her win can -- and should -- be attributed to a variety of unique factors, the campaign's distinctly modern and fast-moving digital strategy program played a significant role. 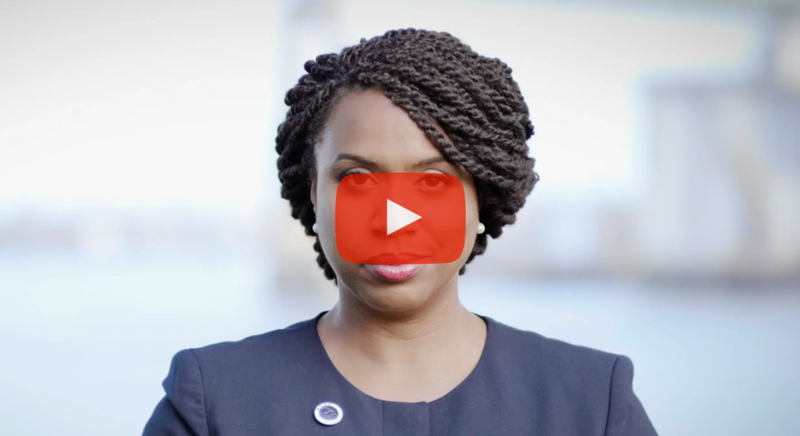 Here we provide an update on Veracity’s earlier Ayanna Pressley for Congress case study, with a special focus on the final six weeks of the campaign. 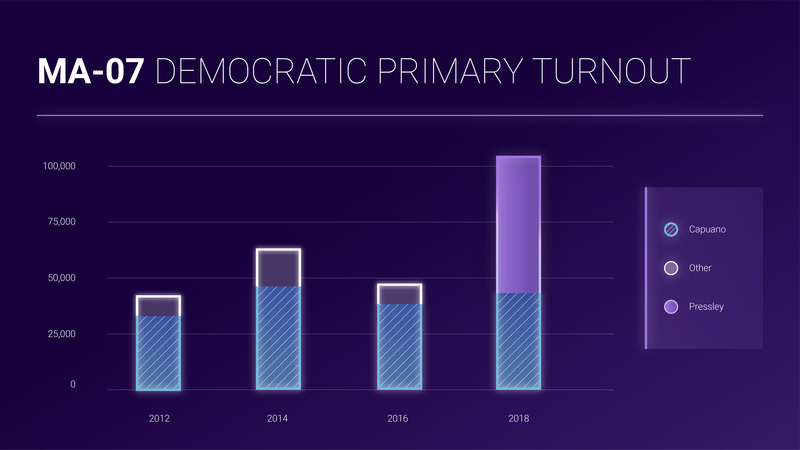 The digital strategies outlined below helped Pressley’s campaign outpace fundraising goals, greatly expand the electorate -- more than doubling the number of voters who turned out compared to the 2016 primary -- and, ultimately, make history. "The Veracity team provided exactly the type of nimble partnership you need when you're running a responsive, grassroots campaign. Their ability to work with us to produce content responsive to what we were hearing on the doors or at community events in the district was invaluable. They brought a winning combination of industry expertise and openness that allowed us to run a strong digital program that was right for our district and this campaign." Throughout the campaign, Capuano outraised and outspent Pressley -- not uncommon given his status as a longtime incumbent. But Veracity and the A-Team spent smarter, not more. This was especially apparent in the allocation of digital advertising resources in the final six weeks before Election Day. Capuano’s campaign spent more than double the amount Pressley’s campaign spent on digital ads. However, throughout the entire campaign, Capuano’s team launched 39 ad variations on Facebook. Of those 39, only six variations launched in the final six weeks -- all of which were English-language ads with only two text variations and the same visual (a single video). In contrast, Veracity launched over 500 unique ad variations on Facebook, with ~200 of those variations launching in the final six weeks. These numbers indicate that the Capuano campaign ran ads with minimal segmentation or targeting. 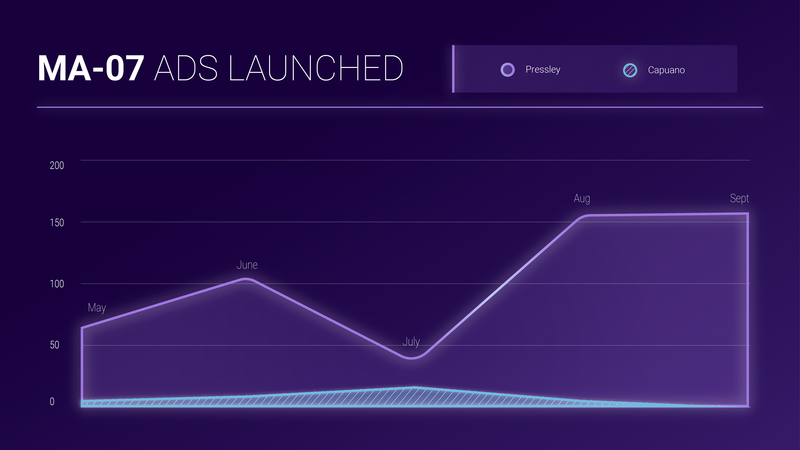 By contrast, Veracity launched hyper-targeted and highly-segmented ads on a regular basis. 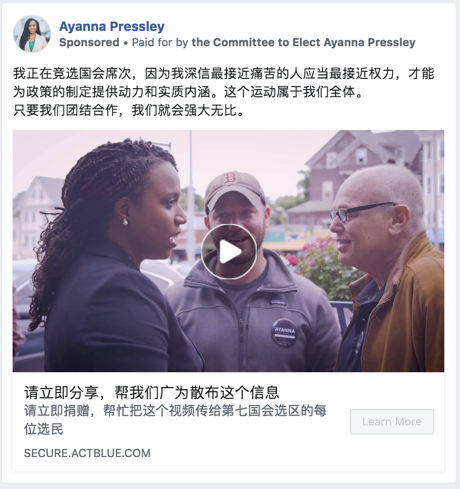 This allowed the Pressley campaign to reach different sectors of the electorate with advertisements relevant to their concerns and background, including ads in English, Spanish, Haitian Creole, and Mandarin Chinese. Text and creative were also updated throughout the final weeks with information relevant to that time period. The creative updates meant our target audiences were able to receive a high frequency of Pressley ads without experiencing fatigue. Veracity’s close coordination and collaboration with the campaign’s direct mail program allowed for a “surround sound” effect timed with the release of their mail pieces. 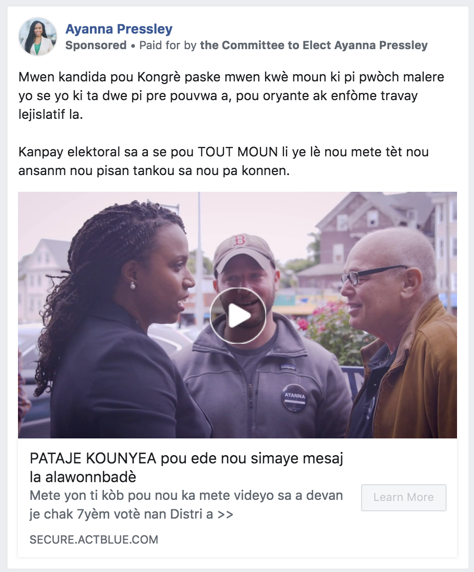 This meant voters receiving the campaign’s mailers then saw social and programmatic advertisements that echoed the imagery and messaging of the physical mail they had received. Veracity also worked to create an internet-wide “surround sound” effect by taking advantage of several platforms, including persistent programmatic display, pre-roll advertisements, and the new (beta) Daily Kos takeover program. The programmatic ads were targeted to follow the most likely Democratic primary voters within the 7th District around the internet, regardless of which sites they visited. And the takeover program allowed for a full site DailyKos takeover within the district for the entire final week of the campaign. 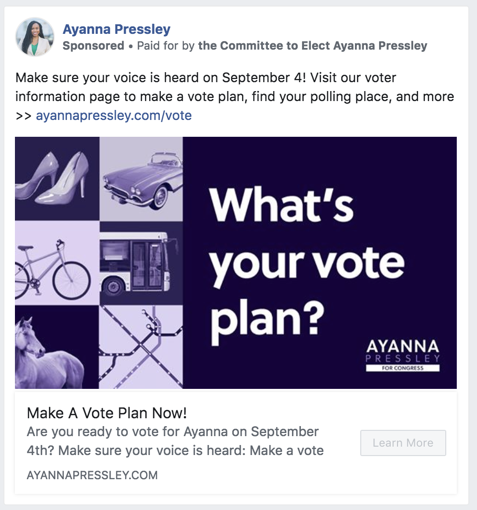 Across digital advertising platforms, the informative focus of content -- along with detailed targeting -- helped Pressley’s campaign greatly expand the electorate. A major asset to the Pressley campaign’s digital efforts was the wealth of high-quality photos and videos provided by the campaign. This allowed Veracity to create a great deal of visual variations and custom-tailored imagery across advertisements, graphics, emails, website, etc. During the campaign, Veracity guided the release of four videos: Why I’m Running, The 1 Bus, Hispanic Community Endorsements, and The Power of Us. This included cross-platform launches (e.g. YouTube, Facebook/Instagram, Twitter), multi-lingual captioning assistance, the creation of unique video donation pages, advertisements, and more. In total, these four videos brought in over $15,000 for the campaign and were viewed over 250,000 times. Throughout the campaign, Veracity created graphics for emails, endorsements, policy announcements, events, and more. Since the campaign launch, Veracity has managed the Pressley campaign’s email program, website, and digital fundraising generally. In August, Veracity launched a Voter Information page. This page featured embedded voter registration and vote plan forms, which hundreds of voters used to register before the August 15th voter registration deadline and to make a vote plan up until Election Day. The page also featured links to state resources, which voters could use to find their polling place and check their voter registration status. 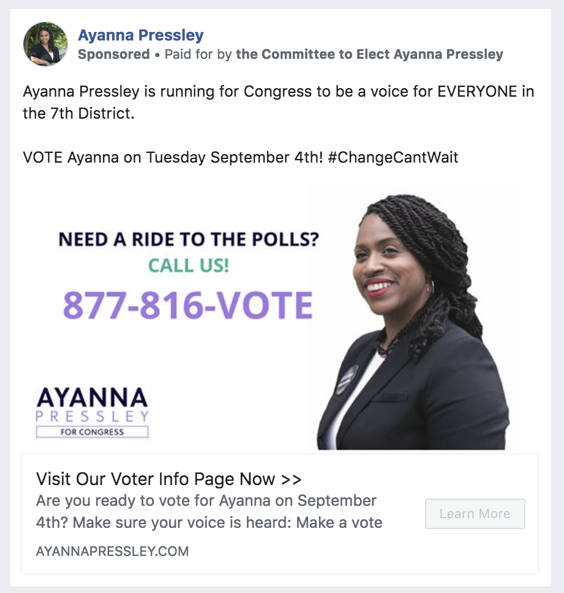 Finally, in the last days of the campaign, the page prominently featured a voter information hotline number which voters could call for information and/or a ride to the polls. In the month leading up to Election Day, this page accounted for 24% of all site visits. Veracity believes the accessibility of this information was key to the Pressley campaign’s success at expanding the electorate. 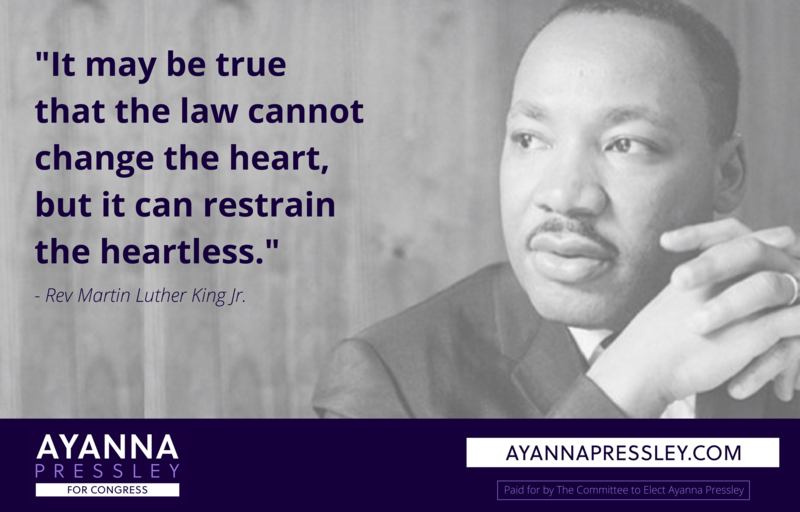 Ayanna Pressley ran a historical and groundbreaking campaign on many levels. Veracity believes one major key to her success was the way in which her campaign understood, valued, and took advantage of the capabilities of digital media. From their January launch through the September Election Day and beyond, the entire Veraci-Team is immensely proud to be part of the A-Team. Together, we proved #ChangeCantWait! 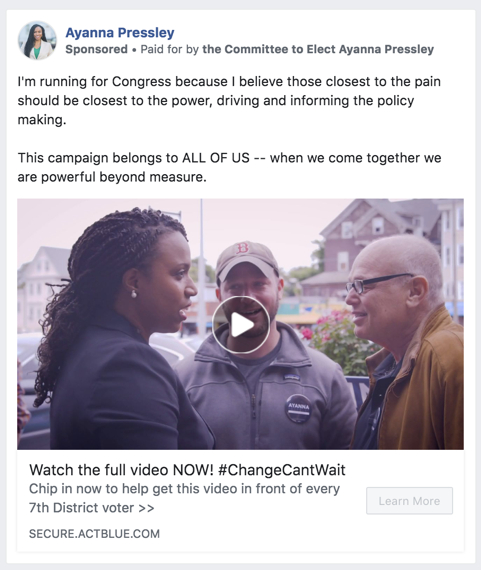 When Ayanna Pressley decided to buck the status quo by announcing “Change can’t wait!” and running for Congress against an 18-year incumbent, Massachusetts’ usually-predictable 7th District suddenly garnered national attention. Veracity Media was with the A-Team from the start, building a rapid-response splash site for her launch announcement and helping craft Pressley’s opening messages to the public via email, social media, and digital advertisements. Veracity also provides ongoing email marketing, digital advertising, graphic design, and web development services to the A-Team. Through this, we’ve enabled the campaign to react to developments with high-quality, rapid-response emails, graphics, and other digital work, such as petition, event, and volunteer landing pages. 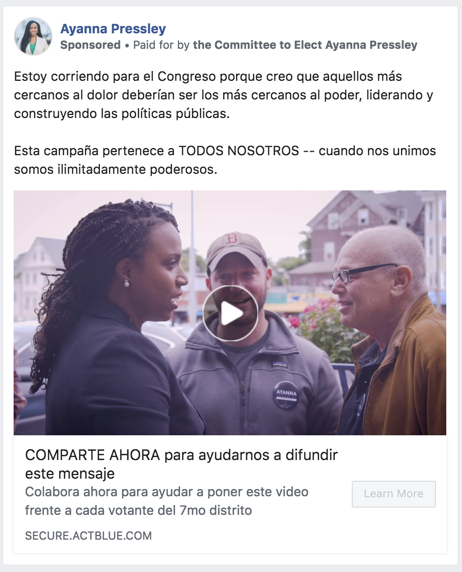 For example, when Pressley released her first campaign video, Veracity helped coordinate a rapid-response, multi-lingual launch across various platforms -- including YouTube, Facebook (both organic content and paid advertisements), Twitter, ActBlue (including a highly shared Spanish- language donation page), and the campaign website. In just two weeks, the video was viewed over 100,000 times and directly raised the campaign $5,000 -- with 60% of donations under $35. 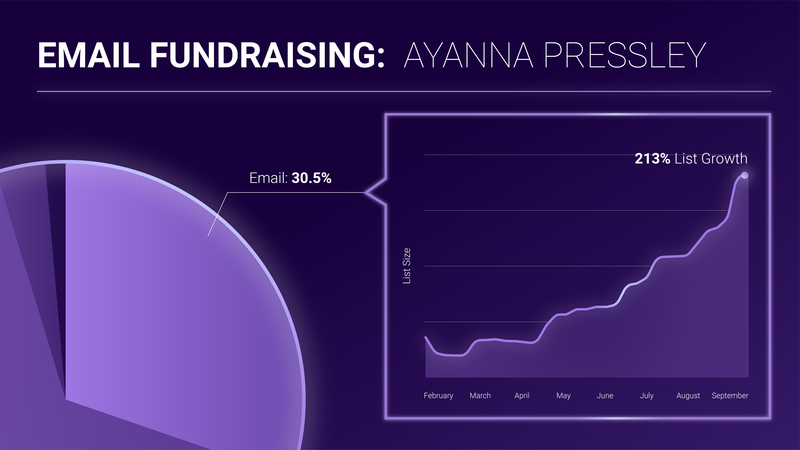 In just over two months from the campaign launch, Veracity raised $138,000 online for the A-Team -- even before investing in email acquisition. Veracity boosted Pressley’s online fundraising from the start of the campaign, delivering a return on investment of over 1000%. This boost was especially apparent once we began running digital ads, which nearly paid for themselves in immediate contributions. 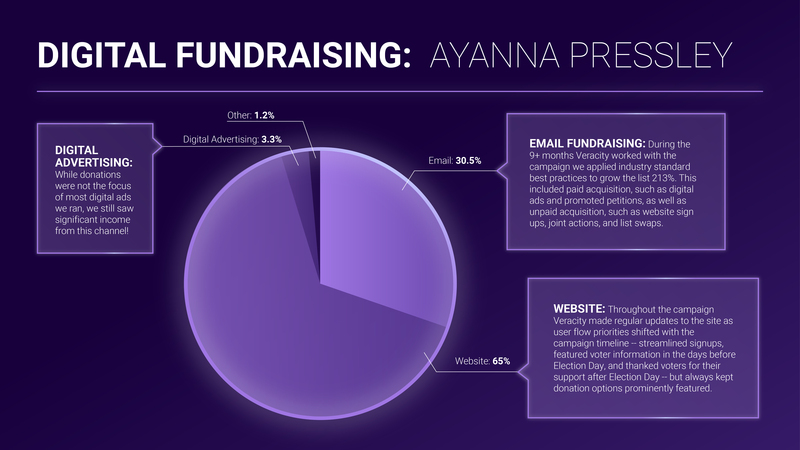 In addition to online fundraising, Veracity provides in-house design to help give Pressley the branding necessary for a successful local and national campaign.